Every now and then someone who knows that I work on human rights asks me what is the worst place in the world. I usually answer the Eastern Congo, but lately I've been answering that it is the prison camps in North Korea, where between 150,000 and 200,000 people are estimated to be held at any one time. 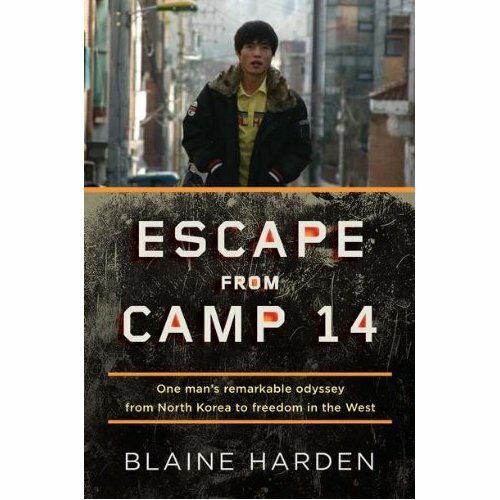 Blaine Harden's book, Escape from Camp 14 (Viking, 2012) is about the only person known to have been born in a North Korean camp and to have escaped. You might wonder how anyone can be born in a prison camp. The North Koreans inprison people to the third generation so that, for example, if your father is convicted of a "crime" (such as sitting on a nerspaper photo of North Korea's former leader, Kim Jong-Il) your mother, you and your siblings, and your uncles, aunts and grandparents might be sent to a prison camp along with your father. But that still doesn't explain how someone can be born in a camp. Shin In Geun was the product of a liaison between a male and female prisoner, who were ordered to have sexual relations as a "reward" for being model prisoners. Shin thought the world in which he was raised was normal-- a normality consisting of routine starvation, backbreaking work even for small children, tortures, and executions. I will not tell you precisely what happened to him and his family, as I do not want to spoil the book for you, but he did not meet anyone who could tell him about the outside world and how normal people behaved until he was imprisoned with an older man at the age of 13. This man tended to his torture wounds and explained something of the outisde world. Later, as a young adult, he met another older prisoner who told him more about the world outside and helped him to escape; his main motive for escaping was hunger, he wanted to eat grilled mean. Even severa;l years after his escape, Shin refered to himself as having been an animal, and having to learn human emotions--especially trust. North Korea is a truly horrible place, and its prison camps are a combination of the Soviet gulag and Nazi concentration camps. Not only that, a state-induced famine in the 1990s killed three to five per cent of the population, and people are starving again now. The international community, so-called, can do very little about the human rights abuses that occur there, as North Korea is threatening to develop nuclear weapons and the fear of nuclear attack takes precedence over humanitarian aid. Perhaps 200,000 North Koreans have fled to China, but China often returns them to face torture, imprisonment and execution. Kim Jong-il died in late 2011, and his young son Kim Jong Un took over. He seems more modern than his father, likes American cartoons and pretty women, but this does not mean he will liberalize. For more academic information in North Korea, see my forthcoming article, “State-Induced Famine and Penal Starvation in North Korea,” Genocide Studies and Prevention, vol.7, no. 2, 2012. But to get a grasp of what North Korean prisons are like for individual prisoners, read Blaine Harden's book.